" What are you waiting for? You're faster than this. Don't think you are. You know you are." “SPEED MASTER” is breaking the sound barrier, leading all dancers to the world of light speed. 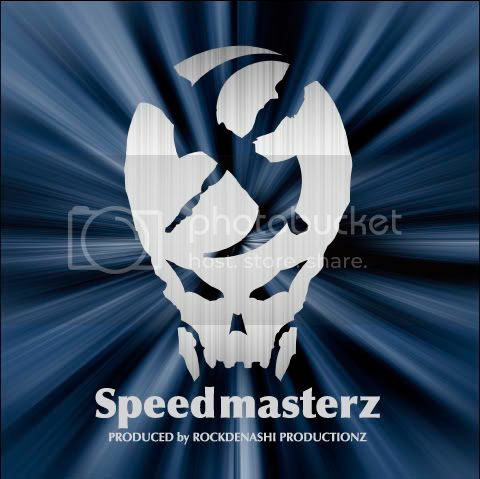 The next compilation album by “ROCKDENASHI PRODUCTIONZ” is focused on “SPEED MASTER“ existing throughout the world. From Japan, “FAR EAST GHOST”, “FATAL DISCORD”, “SPEED DEMON” , “KZ”and"VORTEX" will join in. And in this time, we requested “SPEED MASTER” existing all over the world for their sounds. joined in this time. Hope you to dance to your heart's content by letting yourself go for their perfect sounds. You will go to the world of lights when getting perfectly into the swing of it. I heard previews on beatspace, this will be f@#king solid!!! Great comp! Congrats to all involved. Big BOOOOM to Kasatka for Sonic Age!!! all the best to rockdenashi crew, my bro marco and all artists on this killing disk. if it´s too fast you´re too weak !! good luck with this one ..
i saw this on some other label announcements too ..
do you think it will push your release ? it's only a dj ..
much of success with this release..
MelanWastage wrote: good luck with this one ..
@ MelanWastage - not sure why you so upset when people mention Goa Gil chart. It is a recognition by undoubtedly number 1 darkpsy DJ. His play time is probably bigger then play time of all artists from this forum put together!!! It's an achievement for artist and label. As you understand DarkPsy is underground community with many artists but very very little coverage. can you please tell whose view we can look up? and where? I had a privilege to meet with GG in Tokyo and later be at his secret party that was only 7 hours long due to club restrictions. 7 hours flew like 7 minutes. I only recognized 2 tracks from his entire set. He told me that he played all new material he received recently. I had my mouse open with the quality of music he played! It's a gold mine for any label manager! It is not a secret that artists send GG unreleased tracks before they send them to labels. I do not think GG has his chart for promotion. This is a true indication of what he prefers to play on his parties. Promotion, what else? Ever heard of the theory that if a girl starts screaming, all girls around start screaming? It's basically the same. i'm not upset vic ..
i only was wondering about this "phenomen" .. I agree, i dont see the point bragging about goa gil have it in hes chart list.. Its just a dj, lets forget this big ego thing... I also see this on several releases lately, and its nice but i dont think it belong in a promo text... Only my thoughts though. Whoa! Listening to this on the radio now, and it's awesome! !